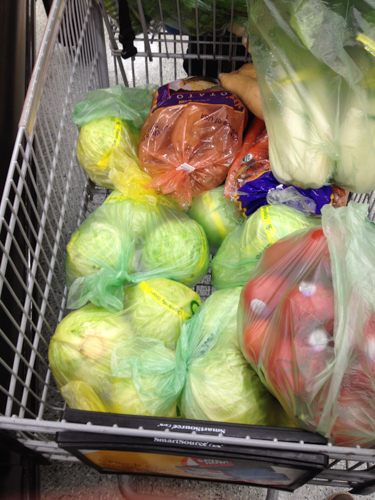 I meant to use only one of the CL crocks, which are 10 liters each, and then use my 5 liter one to develop a brand new recipe but even with my very careful planning I ended up having too much cabbage and had to employ Castiel (the name of the 2nd crock). The plan. I decided on 10 liters of salsa sauerkraut (basically doubling the recipe), 10 accidental liters of hybrid or diluted salsa sauerkraut, and 5 liters of Italian Deli Sauerkraut (the new recipe). I wondered going into this endeavor where on earth was I going to store it all? We talked about a second fridge, but man even used refrigerators are expensive. We rationalized storing it in the garage. 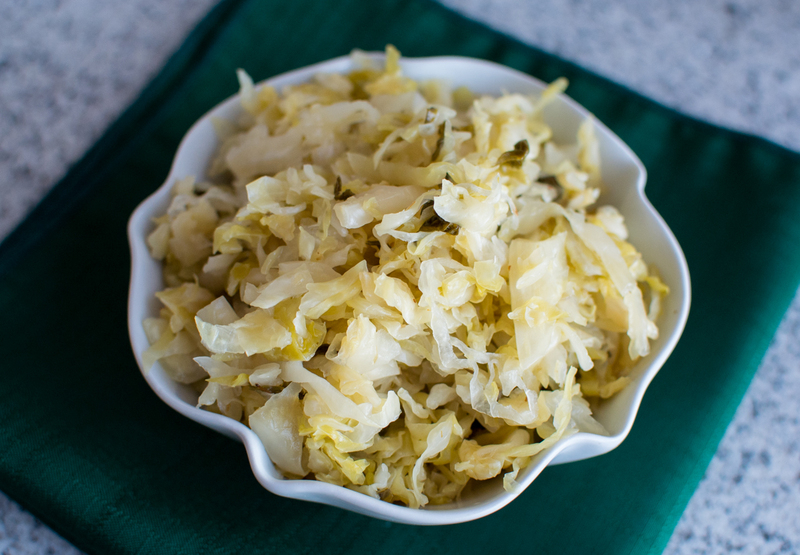 Technically sauerkraut can be stored at 55º F or lower and will not go bad. I mean stuffed in a jar with a lid – not canned or sealed etc. Crazy? Right?! I proceeded even without a storage solution because I figured it would all work out how it needed to. 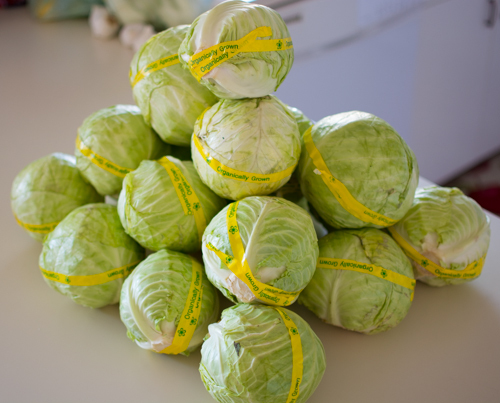 For this round of ‘drawing out the brine’ and getting the cabbage ready, I used one of my 5 gallon food grade buckets and used my hands or the rolling dowel to massage the cabbage. Time went by and I fermented everything between 5 and 6 weeks. Everything worked out great even when it came to storage issues. We gave away several pints to friends which helped reduce quantity as well as get taste testers. 🙂 Rave reviews! I ended up buying 1/2 gallon Ball jars to store the bulk of the sauerkraut. Even though it’s all volume, storing in 1/2 gallon containers seems to take up less space. They’ve taken up anywhere from 1/4 to 1/2 of the refrigerator. 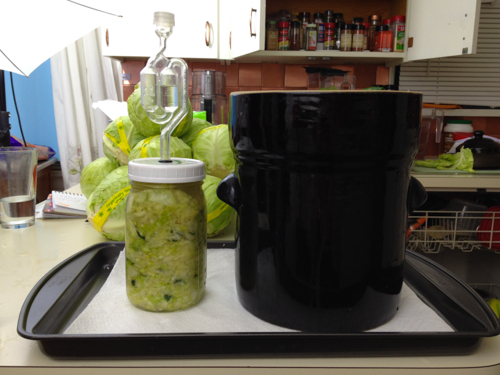 This time around I strained the sauerkraut from the brine before filling the jars. 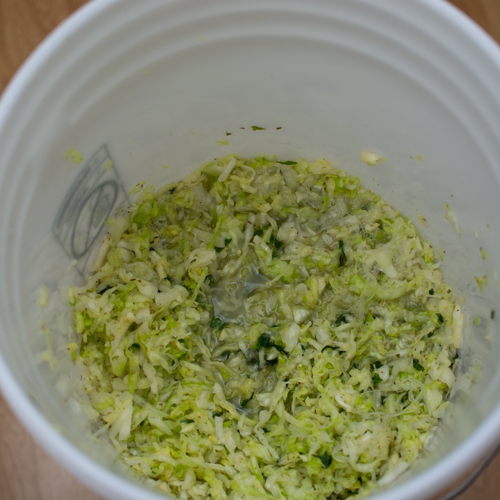 I want to use the brine as the starter in a future batch and eliminate the need for salt thus creating a lower-sodium sauerkraut. Prepare sauerkraut according to these directions. 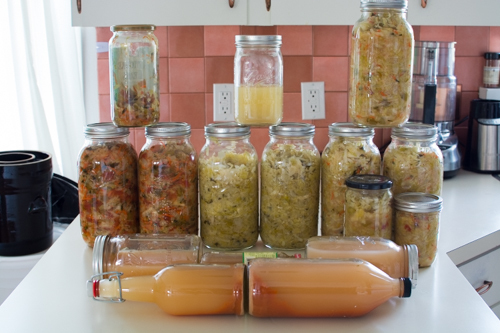 Ferment 3-6 weeks, remove from crock and store in mason jars in the refrigerator. Just recently I used the diluted salsa sauerkraut on my homemade ‘Subway’ sandwiches and it was exceptionally good!